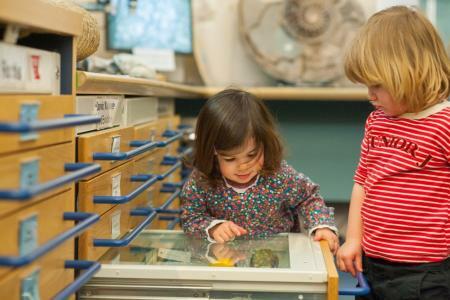 Our parent-recommended museums make bringing learning to life easy and fun. For the chance to explore creatures and people from our past and our present, head to World Museum Liverpool (just watch out for the giant spider!). Immerse yourself in natural history at the vast and wonderfully interactive World Museum Liverpool. Vikki Chapman, in an extended family outing, visited with her mum and her children Adam, 6, and Izzy, 2, along with two uncles and cousins (Lukas, 8, and Rory, 5). Allowing two hours as a minimum to visit, this wonderful interactive museum has such a wide variety of things to see and do. 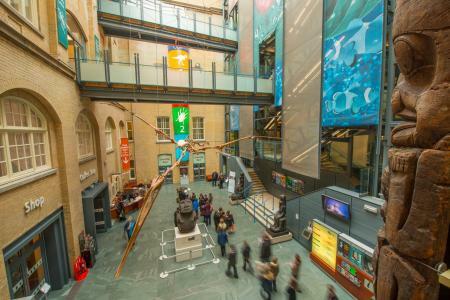 From Natural History and dinosaurs to the Planetarium and Aquarium there’s no doubt it’ll keep every age group, from adults to toddlers, absorbed and happy. You can see shows at the Treasure House Theatre, or get your hands stuck into workshops. There are a number of trails available to make self-guided visits around the museum, plus a huge area with special exhibitions changing every few months. Lockers, some are large enough to fit buggies, are available at the entrance (£1, refundable) and there are plenty of toilets on every floor. The two lifts can get very busy at peak times so it's worth leaving the buggy and taking the stairs. Best of all, it’s completely free! 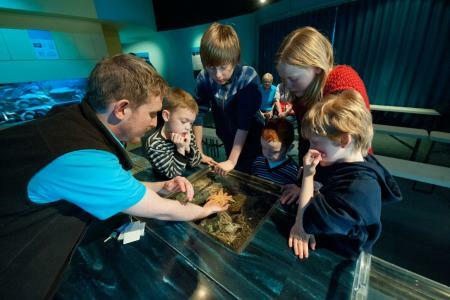 The Aquarium is a big hit with small children and lets you get up close and personal with everything from tropical fish, starfish and crabs to fish you can find in the Mersey. At times there are ‘hands on’ sessions where staff will do a talk on the creatures and children can see them close up. When we visited in March the exhibition was on Magic – the children could dress up and take part in the Mad Hatter's tea party and crawl through the witch's oven in the gingerbread house, and there was a Punch and Judy show on. In the Clore National History Centre my two-year-old daughter loved looking at all the different insects and birds in the drawers. We looked at patterns and shapes of the different creatures. It was good to describe the world around her. We also got the seashore tray on the floor and looked at/touched items such as shells, feathers, mermaids’ purses, egg sacks, sea potatoes. She was fascinated with the brain coral she could touch and feel. The Natural World was a huge hit with my six-year-old son, who loved the giant spider (beware, it is about eight foot across the ceiling and it shakes every now and then!). The leaf cutter ants crawl up and along a rope between their food and their home and you can see them close up carrying items. In the Bones section elephant, zebra, crocodile and hippo bones are available to touch, with clue cards to help children guess what animal they might come from. The staff are really helpful in coming up and offering to show things, too. The Planetarium runs a large number of shows aimed at different age groups. The exhibition of the spring sky is aimed at KS2. We received a sheet at the end to take home showing the constellations at this time of year. The top floor also has the Space and Time section. There is not enough to keep younger children entertained but older children found the computers and displays interesting. We looked at the rockets and telescopes, and how the first telescopes were created. The Weston Discovery Centre has sections on Ancient Egypt, Ancient Greece and Anglo-Saxons. There are mummies and lots of artifacts, including toys, statues, jewellery and replica clothing to dress up in. There are microscopes in the Clore National History Centre. We looked at the patterns on the wings of insects and my son’s fingerprints. Seeing all the different rocks and minerals that can be dug up from the earth and where they come from was both surprising and interesting. The changing exhibitions are usually highly interactive. The ‘Eye for Colour’ exhibition, for example, has lots of hands-on exhibits to explain how camouflage works, how colour is formed, blending colours, and different types of light, mood colours, why we don’t find blue sausages appealing and mess free ‘splatter guns’ on a colour screen. There are a huge number of events and activities – see the website's What’s on guide for details. There are two family friendly cafés with high chairs serving a range of hot foods and sandwiches, cakes, fruit and drinks. Kid’s boxes (sandwich, fruit, drink) cost £3.50. Two large picnic areas are also available on the ground floor and on the third floor. On a warm day St John’s Gardens opposite the museum is a wonderful place for a picnic and an ice-cream from the van that’s usually outside! 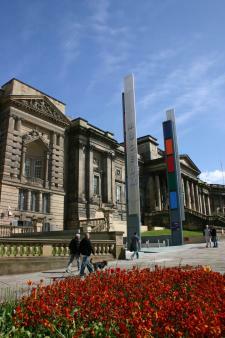 World Museum is right in the centre of the city, a few minutes’ walk from Lime Street Station or Queens Square bus station. The ferry is about a 10 to 15-minute walk. There is parking nearby (pay and display) in front of the museum, and a car park behind the museum. The museum is free and open 10am – 5pm. Closed from 2pm on 24 December, all day 25 and 26 December and 1 January. Two shops; both have plenty on offer at prices starting from 50p. The Collections and Research section of the website has a lot of information. Games and quizzes covering museum topics are free to play.